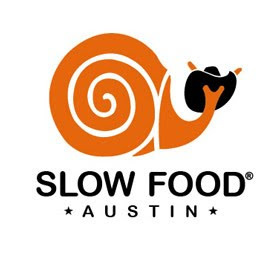 A week ago, we attended the Slow Food Feast in the Field benefiting the Austin Discovery School. (In the interest of full disclosure, I won my ticket as a giveaway from the always awesome Addie Broyles, but we purchased Kurt’s ticket.) 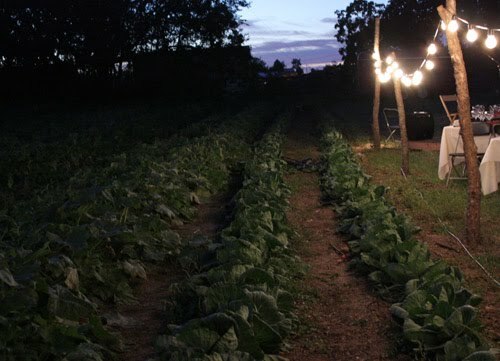 The feast was held at Green Gate Farm which is a short, ten minute drive from downtown Austin, but it was a quiet, peaceful place outside of the city’s hubbub. It was a clear, cool, fall night, and the barn sat in the shadows behind the buffet table of salad, bruschetta, and pickled persimmons. Servers passed trays of duck confit canapes and shot glasses of pureed butternut squash soup, and wine was served from a table under a big tree. 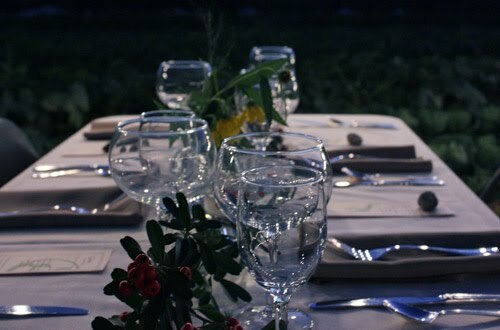 The dining tables were set between planted fields and were softly illuminated by strings of lights. Hence, my photos were of poor quality, but I snapped away just the same. There was even a small trailer from which espresso was served next to the greenhouse. 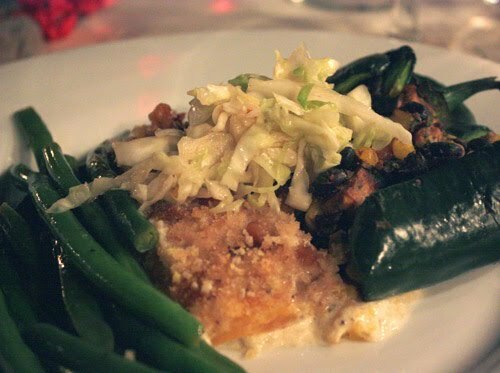 The meal was prepared by Chef Jesse Bloom of Ecstatic Cuisine, and the entire menu was crafted from local vegetables, meats, and wines and much of that local fare came from Green Gate Farm. Butternut Squash Soup with Goat Milk Creme Fraiche. Duck Confit. Asian Pear Compote. Paired with Fall Creek Estate Pinot Grigio. Local Greens Salad Bar with Green Garlic Goddess Dressing. Build Your Own Bruschetta: Eggplant Caviar. Mushroom Caponata. Local Cheese. Pickled persimmons. Paired with Fall Creek Estate Pinot Blanc. Smoky Pork Loin. Blackberry Lavender Reduction. Local Greenery. Butternut Squash Gratin with Caramelized Onion, Walnut, and Veldhuizen Gruyere. Paired with Fall Creek Estate Super Texan. Mary Louise Butter's Brownies with Amy’s Mexican Vanilla Ice Cream. Paired with Fall Creek Estate Port. I requested a vegetarian main course, so I enjoyed a stuffed poblano pepper with black beans, corn, avocado, and chipotle lime tofu instead of the smoky pork. The meal was very well prepared and nicely served, and the warm brownie with Amy’s always-perfect ice cream for dessert was simple but delicious. 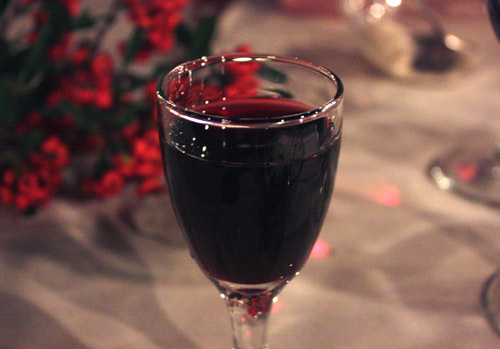 The port with its hint of honey was well-matched with chocolate. In a large saute pan, heat the oil and half the butter. Add the onions and the thyme and cook until the onions are caramelized and reduced to about 1 cup. In a mixing bowl combine the flour, salt, pepper, and nutmeg. Toss the squash slices in this flour mixture to coat. Grease a 9x13 baking dish with the rest of the butter. Arrange half the squash slices in an overlapping pattern to form a layer in the bottom of the baking dish. Spread half the onions on top. Form another layer with the rest of the squash and then top with the other half of the onions. Sprinkle the cheese over the top and then pour the cream over the whole dish. The cream should almost come up to cover the layers. Cover with aluminum foil and bake in a 350 degree F oven for approximately 20-25 minutes or until the squash has mostly softened. Remove from oven and remove foil. Mix the breadcrumbs and nuts and spread over the top of the gratin. Return to oven and continue baking for 10-15 minutes or until topping is golden and crispy and squash is fully cooked. looks fantastic. i'm always lookin' for new side dishes for t-giving. this one is definitely in the running! the event looked very beautiful and relaxing-thanks for the pics. First of all, I want your main course for dinner tonight! Second of all, thanks for sharing the recipe. I have been thinking of doing something squash for our Thanksgiving table since sweet potatoes aren't a big hit. What an amazing meal and how lovely to enjoy outside! What a great meal and I'm so glad they shared that recipe with you. It may make its way onto my Thanksgiving table too. What a cool looking event and a lovely looking dish! The meal sounds amazing and the gratin is a recipe I would love to try. Bravo! I wanna have a nice meal by the farm too! Looks like a lovely evening. The menu sounds delicious, too. What a lovely event and the butternut squash gratin sounds heavenly! What a wonderful event! The food looks incredibly delicious and the setting gorgeous! The gratin is going on my 'must make' list! That's lovely meal and evening! Would be really nice to have a meal by the farm too! Neat event and the food looks delicious! Oh that looks like the perfect outing and the food sounds fantastic! Great soup recipe! Yum! wow!! vat a lovely meal! What a great event to attend and the butternut squash gratin sounds terrific! That sounds like fun! The Butternut Squash Gratin sounds delicious! I love the table, not to mention the menu and the food looks mouthwatering...butternut, wallnuts and chees, mmm... now there's a winner! I love going to events like that - you get to try so many things that you wouldn't normally try! And I may steal your gratin for my Thanksgiving table! Thx for the recipe, gruyere cheese is not a difficult thing for me to get here, gotta try ! What a magical and memorable meal! I love eating outdoors like that, not in the usual picnic-way, but all done up with fine glassware and china. A splendid dish this is!! I so love butternut squash!